Marcus and I had a fun date night this past Friday, beginning with hot dogs at one of our favorite spots, Asiadog. The end of our night brought us to La Churreria, only three blocks away. Jesús "Lolo" Manso, owner of tapas/paella favorite Soccarat, opened La Churreria this past December with hopes "to bring another piece of Spain to New York." The churro machine is even from Mr. Manso's hometown of Valladolid. 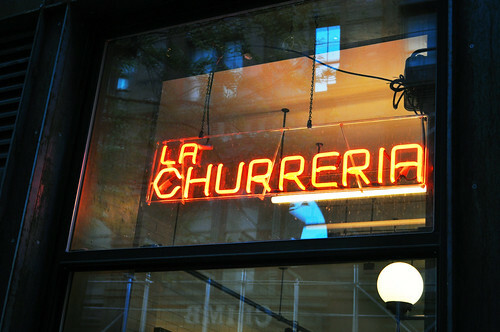 In Spanish, the suffix, -eria, is added at the end of a noun to mean "(noun) shop" -- thus, churro + -eria = La Churreria. Churros are eseentially treats made from Spanish dough that are fried with a crispy exterior and a soft interior and lightly dusted with sugar. They are typically eaten by themselves or dipped in hot, melted chocolate. 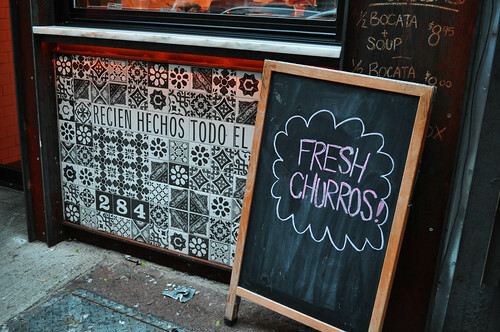 The churros here are "recien hechos todo el día" -- freshly made every day. 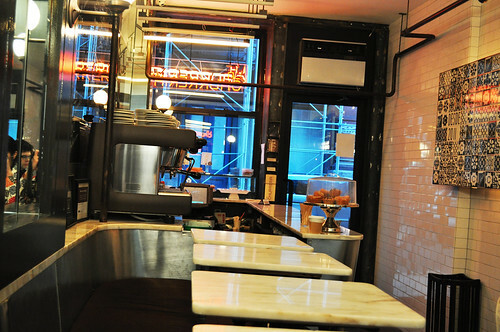 Inside La Churreria. The Tallavera tile design (same as it appears on the storefront) on the wall on the right is intended to be reminiscent of Spain. Since we were pleasantly full from our hot dogs, we decided just to share the "Churros for 1" which comes with six churros. These fried, curly treats came straight from the fryer all hot and crispy with a generous dusting of sugar. Heavenly perfection was sitting right here on this very plate. The churros were the perfect size for taking in small bites and savoring each and every one of them. 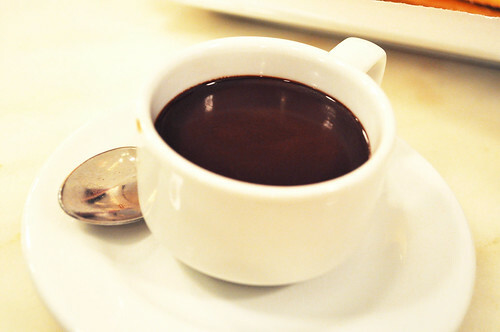 Served alongside the "Churros for 1" was an espresso cup (small-sized) of hot dipping chocolate. With a nice, liquidy consistency, the chocolate was dark and bittersweet. With every dip into the chocolate, it would coat the surface of the churro's end as the excess chocolate oozed off when it was taken back to be eaten. Once the churro hit our palates, the warmth from our mouths and the hot chocolate melted the fried dough into an intensly ambrosial bite. If anything, these classic churros are alone worth the trek down to SoHo! We also tried the churros rellenos (i.e., stuffed churros) with dulce de leche, but these fell short of our expectations. They arrived to our table cold (not even lukewarm! ), but we didn't realize this until we took a bite into it. Unwarm churros are not friendly at all on the palate. 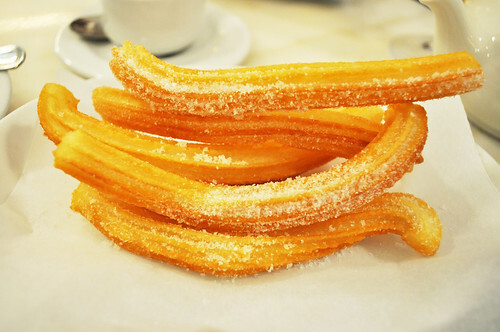 I think if these were piping hot or even lukewarm, we would have delighted in these as much as the regular churros. It was definitely our fault for not speaking up to the waitress, but by that point, we were already so full from the churros we had eaten. Findings: If you love churros, you should bring a few of your friends with you to La Churreria and just nom on some churros, dipping them into hot chocolate sauce at your leisure for some awesome dessert action. Just be wary that the service isn't the greatest -- it's more like a café-style spot that is really small, as you can see from my photographs -- so just expect really good churros and decent service. To be fair though, our waitress was pretty speedy in getting our churros to us. Also, if you get the churros rellenos, make sure they were served hot/warm before you bite into them so that you get the right experience. I'm sure any piping hot churros stuffed with any warm, sweet sauce like dulce de leche and chocolate will taste as delicious as it sounds. 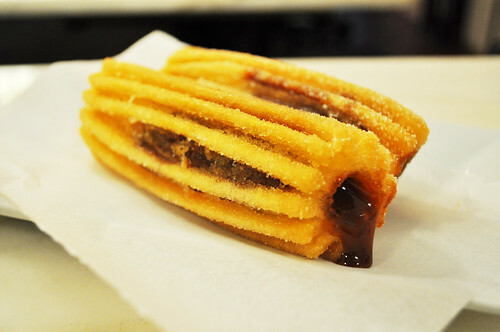 Price point: $6 for Churros for 1 (6 churros and small-sized dipping chocolate), $3.50 for each churros relleno.